As most of you may know, I’m utterly hopeless when it comes to technology and all things related. With all the features most smartphones are packing these days, I only use my iPhone to call, sms, take pictures, and at most, upload a photo or two to Instagram. I’m rather old-fashioned, and would prefer to use a pencil and sketchbook to draw out my designs, rather than the newfangled devices that a lot of designers are using these days to electronically prepare their art. These somehow remind me of CIMB. 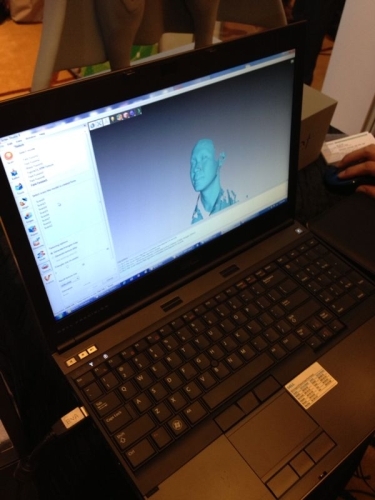 This is done with a 3D scanner. 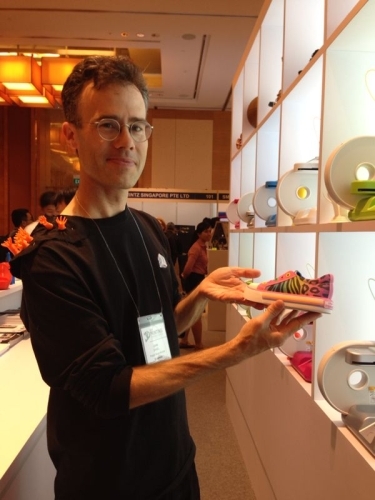 So, I managed to surprise myself (somewhat) when I decided to head down to Singapore to visit the 3D Printing Conference and Expo, which was held on the 1st of October. 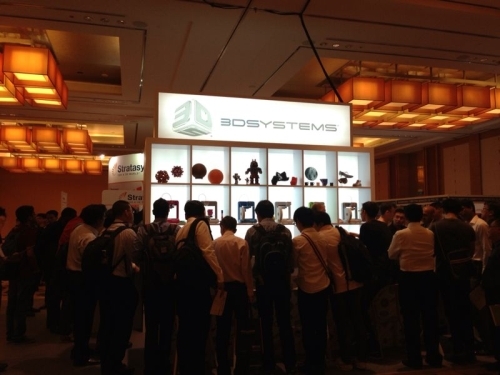 Held at the luxurious Marina Bay Sands, it would be the first B2B 3D printing tradeshow in the Asia-Pacific region. 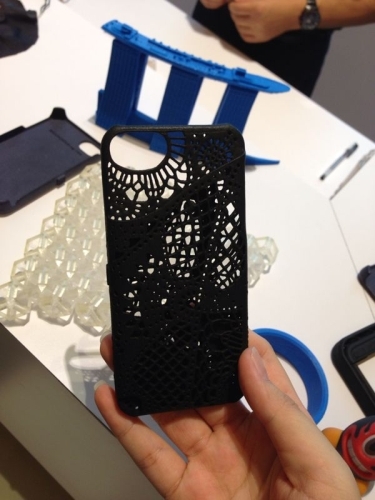 3D printing refers to the process of layering material in a specified design until the desired output is achieved. Can’t imagine what it looks like? 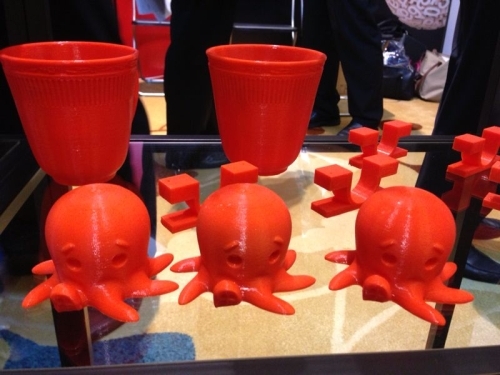 Well, think of a traditional colour printer that you have hooked up to your PC, but instead of printing out pictures on a flat piece of paper, it prints out cups, plates, spoons, keychains and whatever else you can think of (and design). 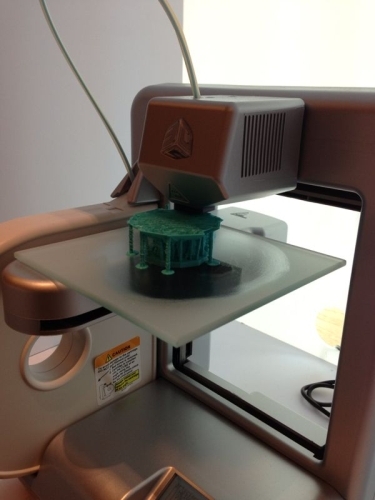 The first 3D printing machine appeared in 1984, but began to pick up in advancement in the last couple of years. A totally different expo from I’m normally used to! 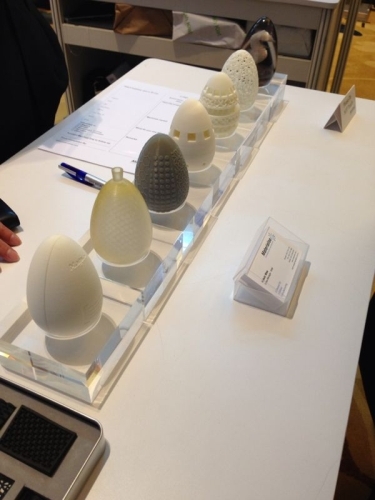 Now, you must be wondering, what does 3D printing have to do with my line of work? 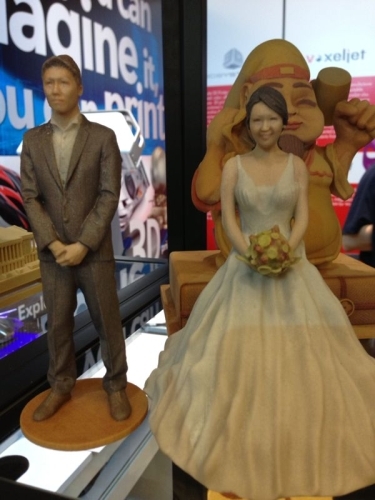 After all, wedding gowns and robotic 3D print machines are worlds apart. It was the same question that I asked myself all the way to Singapore, with Shirley in tow. I briefly heard about 3D printing on BFM, and out of nagging curiosity, decided to go out on a limb and attend the event. I eventually got my answer as I began to walk around the convention. The (hidden) inner geek in me began to come alive, as I saw rows upon rows of sophisticated equipment, all whirring away with mysterious beeps and pulses. Almost every booth had a version of the print machine, complete with a bespectacled evil scientist standing next to it, ready to explain (at length) on how the process worked. Initially, I was rather intimidated at the complexity of the machines, but after several lectures on their inner workings, I began to comprehend their vast potential. If these pictures remind you of an engineering fair, well, you’re not to be blamed. Its like watching a space movie. These guys are really, really into their jobs. Don’t be fooled by his pleasant look – that’s an evil genius holding a plastic shoe, right there. This reminds me of the times when I’m showing off my gowns to a client. Like an ice-cream machine, just a lot cooler! 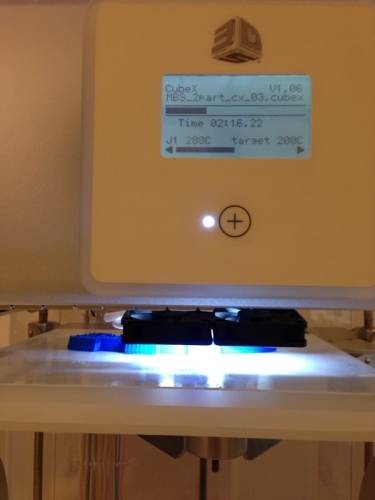 In essence, the 3D printer works pretty much like a normal printer. A designer would cook up a 3D model of a product, and hit ‘print’ on the CAD (Computer Aided Design) software. 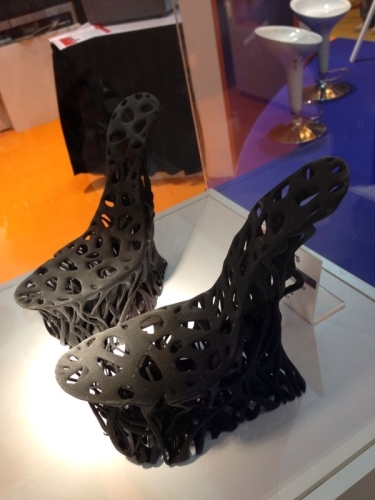 The 3D printer would then get cracking, and spin out a polymer prototype of that design, all within minutes to a few hours depending on the complexity. 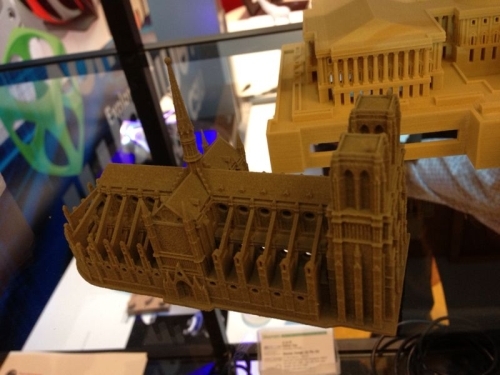 Rome wasn’t built in a day… but the replica of a cathedral was printed within a few hours. How would this be of use in the wedding design industry? Imagine the ability to design corsages, fascinators, headpieces and accesories exactly to the customer’s expectations, and delivering the finished product within minutes!? Customization and the ability to develop prototypes of my shoes for my customers to touch and feel before buying the finished product! It sounds incredibly high-tech, and in truth, it really is! Imagine: Personalized wedding favours! They can come in life size if you want! 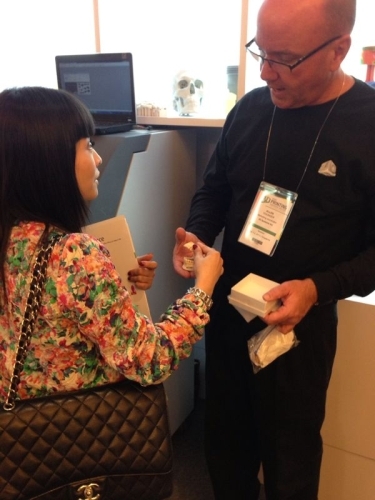 Shirley checked out some handphone accessories… printed from a PC. 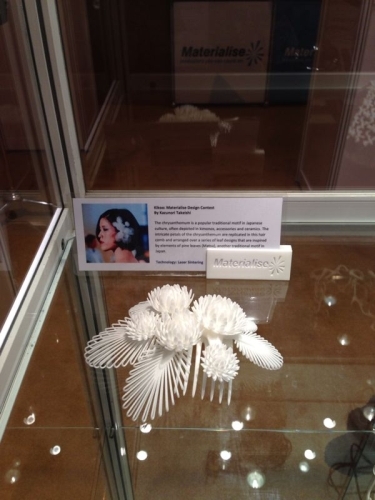 An elaborate hairpiece… See how intricate it is. 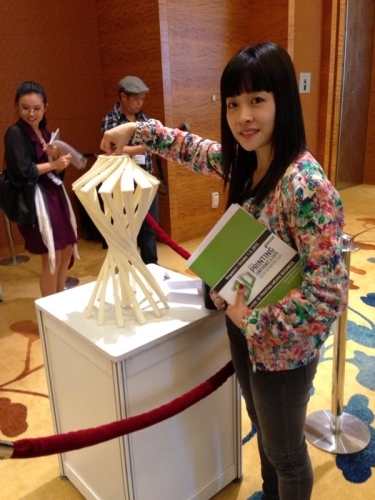 This is a foldable stool…isn’t it impressive? Shoes prototype! Well, not for everyday wear, but think of the possibilities! 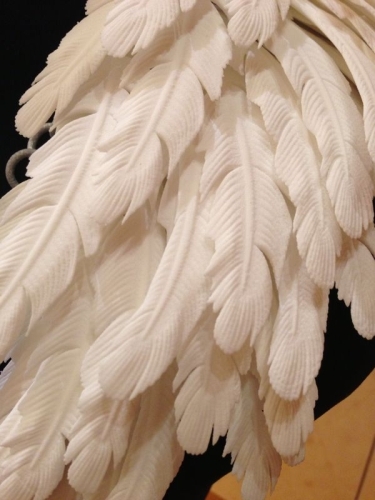 Icarus made his wings from feathers and wax… these scientist made them from photopolymers and thermoplastics. 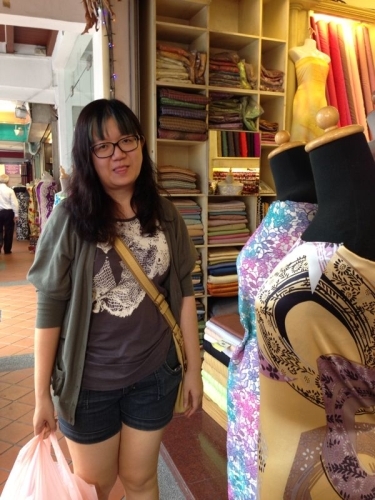 After a long day of walking about the convention, Shirley and I visited Arab Street to pick up new fabrics. 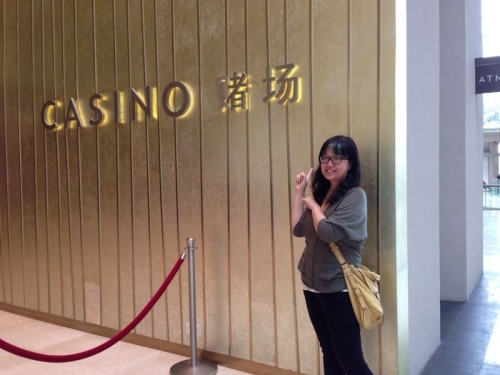 It was Shirley’s first visit to Singapore, so the trip eventually became a sightseeing one for her! 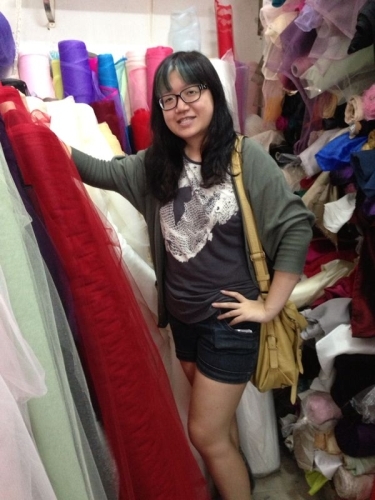 A fabric store may not be the best backdrop for a photo. A somewhat exhausted bee after walking for hours with fabrics in tow. 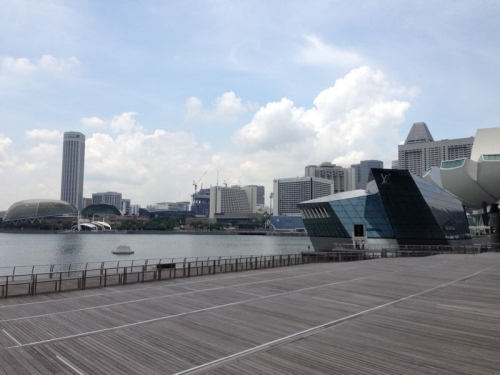 A leisurely stroll on a hot afternoon… love the Marina area! One thing this trip thought me; in as much as I’d prefer to stick to my good ‘ol pen and paper, technology is moving in leaps and bounds, and if a designer doesn’t try to keep up, or at least explore the potential technology has to offer, he/she is definitely bound to be left behind in an increasingly competitive market. I’m definitely not the only one impressed by this technology. 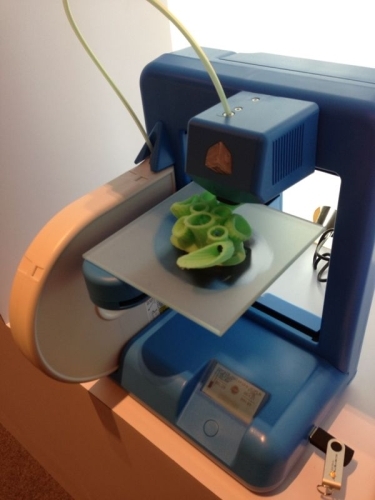 Unfortunately, at this point in time, 3D printing remains a lofty dream, due to cost (it doesn’t come cheap! the lowest priced machine costs a few thousand ringgit) and a steep learning curve (it would take me the remainder of my life to learn up 3D modelling software), but who knows what could happen in the future?